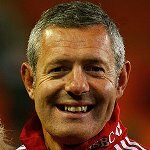 Gavin Hastings is best known as an international rugby player. He achieved 61 caps as full back for Scotland, 20 of them as Captain. He captained the British Lions on the 1993 tour to New Zealand and scored 700 point during a phenomenal career which has seen him tour the globe. His contribution to British rugby was acknowledged with an OBE in the 1994 New Years Honours List. Gavin retired from the rugby field in 1995 after his third World Cup. His company manages sponsorship deals for clients wanting brand awareness through association with high profile sporting events or teams. Current clients include Famous Grouse whisky and BT Cellnet. Gavin has also been the driving force behind projects such as Scotland’s 2009 Ryder Cup bid.